Whether you are a seasoned rail traveller to the snow, or considering trying the train instead of flying, there are plenty of options. You don’t have to choose the classic resorts either. And while France is the obvious destination, more routes have cut journey times to the other Alpine countries too – so don’t discount them. Rail guru Daniel Elkan of Snowcarbon has sent us his pick of overnight sleeper trains and resorts to consider. There’s something romantic about the idea of overnight travel to ski resorts. You get on board in London or Paris, knowing that you’ll be in the Alps the next morning, with (hopefully) snowy scenes outside the window as you arrive. 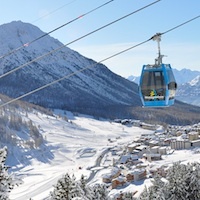 But this way of getting to resorts also has a practical value too: by going overnight you get to ski on arrival and departure days – two extra days in total. You can reach resorts in France, Italy, Austria and Andorra by overnight train. Here are six of the best. There are few resorts to match Les Arcs in terms of miles of rolling reds and cruise-friendly blue runs. 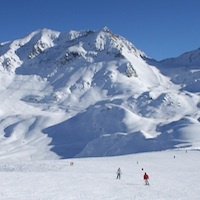 The resort consists of four car-free villages at various heights (plus base-town Bourg St Maurice) and makes up a large part of the 425km Paradiski area. One of the finest runs is the 7km – long Aiguille Rouge, with a vertical drop of 2000 metres. Journey: depart London St Pancras on the 18:02 Eurostar, change in Paris and take the 22:48 Corail Lunea sleeper train to Bourg St Maurice, arriving 07:46. From there it’s a 20-minute taxi, or 7-minute funicular ride. Nestled at 1760 metres, Claviere is the kind of village that oozes Italian Alpine charm, with a laid back feel. Many of the slopes are treelined with great terrain for intermediates, and there are the challenging black runs of Fraiteve and Moncrons above Sansicario. Great mountain eateries abound, none better than Chalet Mon Soleil at La Coche. Journey: depart London St Pancras on the 17:32 Eurostar, change in Paris and take the 22:03 Corail Lunea sleeper train to Briancon, arriving 08:30. From there it’s a 30-minute taxi ride. Well loved by the French, little Grand Bornand is largely unknown to the British market. This shouldn’t be the case because this family friendly resort has a lovely traditional village, great mountain restaurants and intermediate-friendly slopes that have plenty of accessible off-piste too. 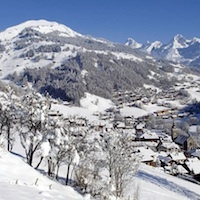 Together with its close neighbour La Clusaz, the Aravis mountain range has some of the best views in the Alps. Journey: depart London St Pancras on the 18:02 Eurostar, change in Paris and take the 22:48 Corail Lunea sleeper train to Annecy, arriving 06:52. From there it’s a 35-minute taxi ride or 55-minute bus ride. Alpbach’s old wooden chalet’s have been welcoming British guests for years, and for good reason. 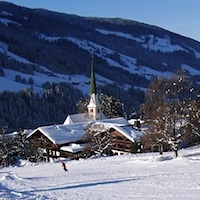 The village is a charming place, centred around a stunning church, and the ski area, although not huge, has plenty of winding reds from the top of Gmahkopf. Beginners have their own nursery slopes right by the village. Journey: depart London St Pancras on the 15:02 Eurostar, change in Paris and take the 20:20 City Night Line sleeper train to Woergl, arriving 09:41. From there it’s a 30-minute taxi ride. 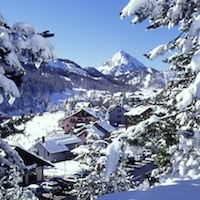 Situated close to the Italian border, Montgenèvre is the sole French representative in the 400km Milky Way ski area. Although it isn’t ski-in-ski-out, most of the accommodation is five minutes from a lift, and the beginner slopes pour back onto the village, meaning nervous novices can easily congratulate themselves with a vin chaud straight after the day’s lessons. For experts there isn’t a huge amount of challenging terrain but lots of off-piste, and intermediates are amply catered for here too. Journey: depart London St Pancras on the 17:32 Eurostar, change in Paris and take the 22:03 Corail Lunea sleeper train to Briancon, arriving 08:30. From there it’s a 20-minute taxi ride. Brides les Bains bills itself as “good-value skiing”, and rightly so. Staying in this little spa town, you’ll pay a lot less for accommodation than you would in Méribel or Courchevel, 20 minutes up the road, and yet get access to the 600km of the Trois Vallées ski area. 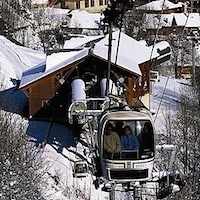 The drawback is the 30 minute gondola ride up to Méribel, but Brides has a lot going for it, and plenty of spas to soak in at the end of a day’s skiing. Journey: depart London St Pancras on the 18:02 Eurostar, change in Paris and take the 22:48 Corail Lunea sleeper train to Moutiers, arriving 07:07. From there it’s a 10-minute taxi ride. Change in Paris easily: If you are changing from the Eurostar terminal at Paris-Nord to Paris-Austerlitz for an overnight Corail Lunea, by far the easiest way to get there is with a pre-booked taki from British transfer company Paris City Line (www.paris-city-line.com). Their drivers wait for you at the end of the Eurostar platform and an 8-seater transfer costs 50 €. Get low fares: If booking online yourself, remember to split the booking into two parts, separating the Eurostar to Paris from the rest of the journey. This will enable the online booking systems to show you promotional fares that would otherwise have not been visible if you tried to book the whole journey in one go. Make a weekend of it: Most overnight trains run every night, making it a good transport option for weekend trips. You can leave on Thursday evening and ski Friday, Saturday and Sunday, returning into London on Monday morning, ready to annoy your colleagues with tales of snowy slopes. Ski Weekends are introducing overnight rail packages to Brides les Bains and other resorts by train.